Italy and opera is a match made in heaven and the Verona Opera Festival is the pinnacle of this beautiful marriage. 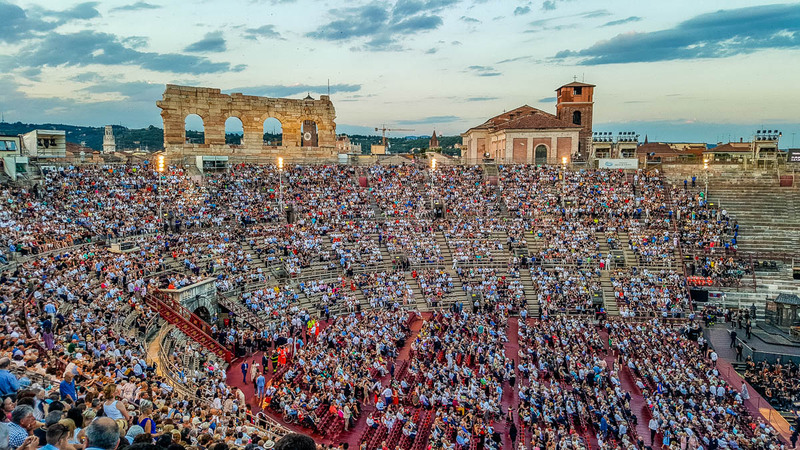 Hundreds of thousands of people from all over the world flock to Verona in Northern Italy each summer in order to enjoy an outstanding opera performance under the stars in the city’s Roman Arena. This year, I was one of them. I saw Turandot on the last day of June 2018 and I am still buzzing with excitement. Attending the Verona Opera Festival exceeded all my expectations. If you have ever wondered if you should give it a try, I can only emphatically tell you: Do it! And do it now! 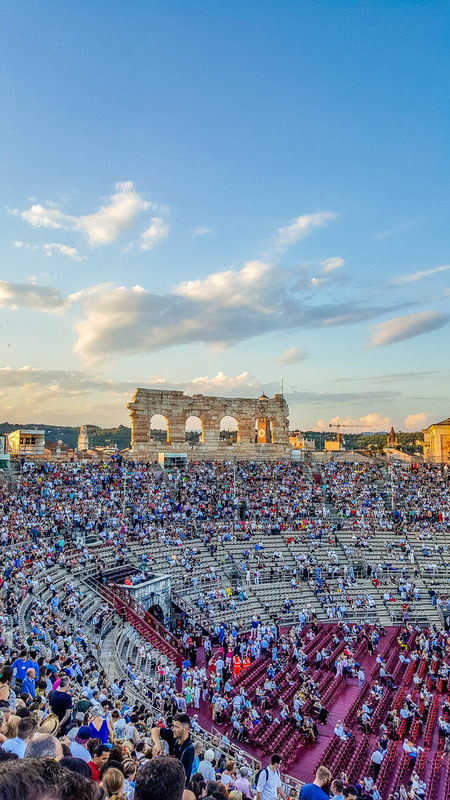 No matter if you are a fine connoisseur of opera or a complete novice to the scene, seeing an opera at Arena di Verona may become one of your most cherished memories of Italy. Just like it happened to me. Now, I want to give you all the details to make your night at the Verona Opera Festival a smooth and memorable experience. 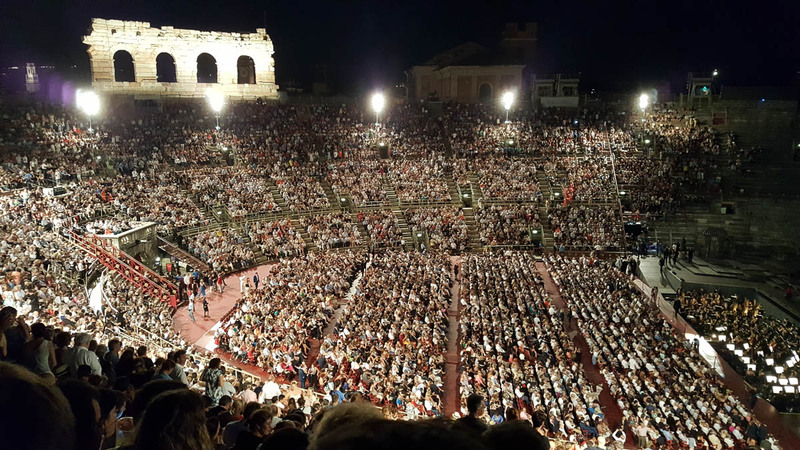 Hence, on this page, you will find a first-hand account of my experience followed by a practical guide with the festival’s short history, important figures, tips and tricks, including where to sit and how much a soft drink costs inside Arena di Verona. I have tried to answer all the questions you may have like when to buy your tickets at the cheapest price, should you bring your child(-ren) to the opera, and is it really necessary to have a cushion to sit on the ancient amphitheatre’s stone steps. Everything is covered. There was definitely something magical in listening to Puccini’s Nessun Dorma soar up to the sky from the stage with a spectacularly lavish stage set. Perched on the edge of the stone step on the penultimate row of one of the largest preserved Roman arenas in the world, I looked at the thousands of people around me collectively holding their breath. I felt the goosebumps flowing down my spine and just as the tenor, the conductor, and the orchestra launched into an encore of the iconic piece, I had that unique feeling of being part of something special. Something exceptional and outstanding that made me forget about the small problems of my daily life and lifted my spirit sparkling a long-forgotten desire to savour the world, to turn this mortal, often baffling existence into an inspiring achievement. If Calaf was savouring his imminent victory on stage, alongside I was savouring the potential of triumph and had my dreams returned to me. The music, the singing, the energy on stage made it possible for me to dream again. And this is the beauty of art which the Verona Opera Festival, on the verge of its 100th edition, is one of the best expressions of. Attending the Verona Opera Festival has been on my to-do list since the very first month of my life in Italy. Yet, for many reasons, it took my husband and me four years to actually do it. First, our child was too small and we simply couldn’t bear to leave her with a childminder overnight. Then, we bought tickets months in advance to see Aida in 2016 but, as it happens, we had to travel to Slovenia on the exact day of the performance. And then we just kept talking about it but not doing anything to make it happen. So, this year when my husband received for his birthday tickets for the Verona Opera Festival performance of Turandot, it was just what we needed to get organised and trot to the opera on the last day of June. I must admit that we are not really die-hard opera fans. Both of us have been to opera performances before and we even made an effort to go and see Puccini’s Manon Lescaut last year in Varna, Bulgaria. Which was fabulous in terms of singing but, unfortunately, I personally found the stage set a bit lacking in glamour and extravagance. It’s possible that I am a bit superficial in this respect but for me to feel in awe and really drawn into the performance, opera is as much about the singers’ operatic prowess as the lavishness of the decors. 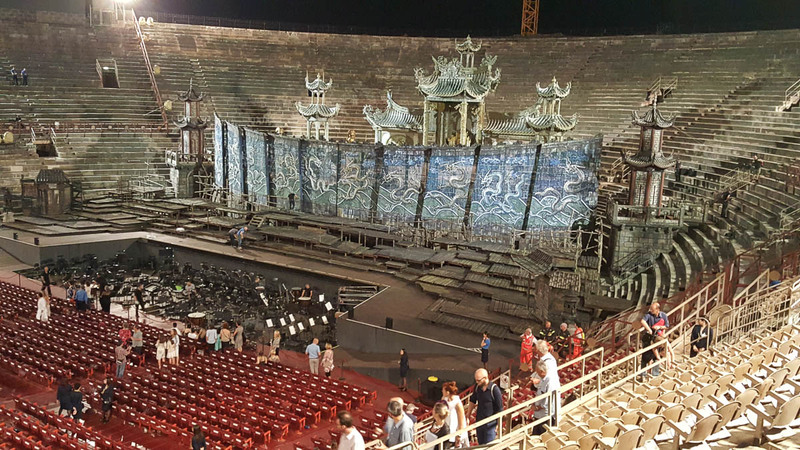 So, I was looking forward to seeing Turandot at the Verona Opera Festival and finding out for myself if the stories about its out-of-this-world stage sets were true. I shouldn’t have worried myself! We reached Verona from our current hometown of Vicenza in about 45 mins. Something which still amazes me to this day considering that often it would take me longer than this to reach one point in London from another. We parked the car (see car park details in the practical information section below) and walked the short distance to the majestic Arena di Verona. Which always takes my breath away. This was the case again on this hot and clammy summer evening. The effect the 2000 years old Roman amphitheatre customarily produces on me was immeasurably amplified on this occasion though. 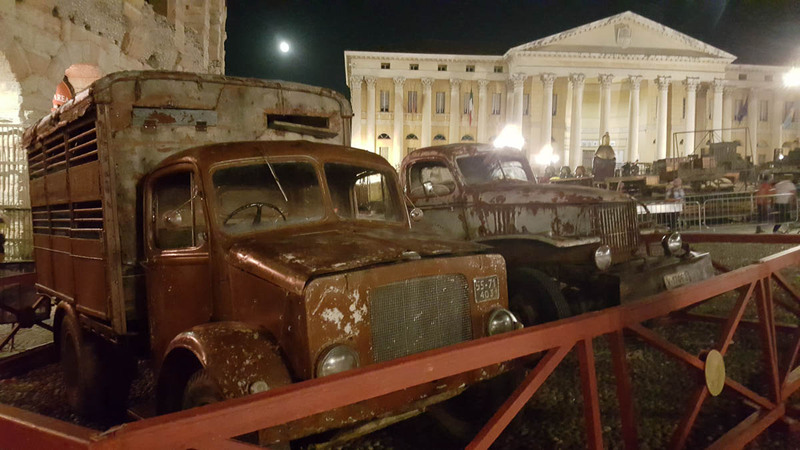 For it was surrounded by the huge pieces of the different operas’ stage sets for this year’s edition of the Verona Opera Festival. 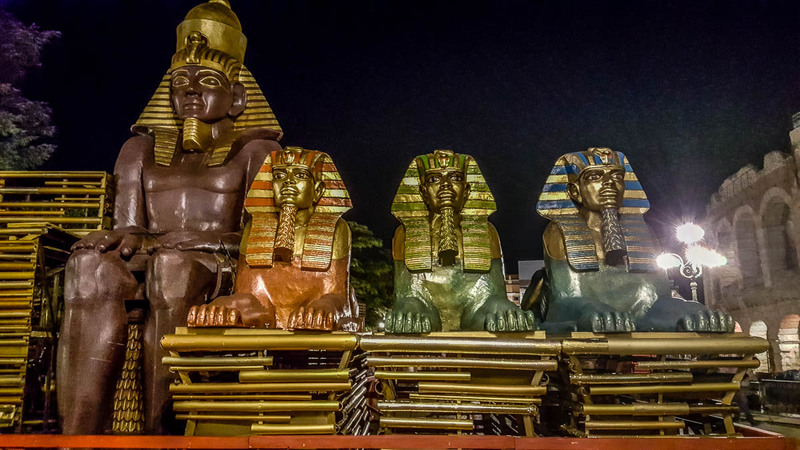 Aida’s large Egyptian obelisks and gods stood metres away from the vintage vehicles they use on stage for Carmen. Huge posters from previous editions of the festival were affixed to the metal barriers surrounding the props. A tall crane loomed above us, strategically placed to lift Egyptian, Chinese and Spanish decors and arrange them on the large stage on the other side of the walls of the Roman Arena. Piazza Bra – adjacent to Arena di Verona and one of the largest squares in Italy – was teaming with people. Long queues were curving and stretching around the arena and with the help of a kind Italian policeman we soon found where we had to queue in order to follow the crowd inside. The security check was thorough but quick and before we knew it, we were inside the arena where ushers were guiding the constant stream of people to their seats. As we had arrived only half an hour before the start of the performance and had tickets with no assigned seats, we were pointed up to the penultimate row. After scaling the irregular stone steps we found ourselves almost on the very edge of Arena di Verona. From our high vantage position, we watched in awe the thousands of people around and below us. The cascading rows of seats soon were completely full and conversations in a multitude of languages filled the air all around us. A group of French people behind us had cleverly taken residence on the very last row of the stone steps. This secured them the back support that the rest of the stone steps’ seats was lacking. The young German couple in front of us tucked into melting ice-creams in a futile attempt to cool off after a day in which the thermometer had again hit 32 degrees Celsius in Northern Italy. To our left were three Italian ladies and on the right, a Flemish-speaking mother and her adult son completed the multicultural diamond shape around us. We grabbed a cold drink each from the refreshment vendors, positioned our brought from home cushions on the steps, and took the glorious scenery in. In the dusk the majestic decors of Turandot glistened on stage suggesting that we were in for an operatic treat. 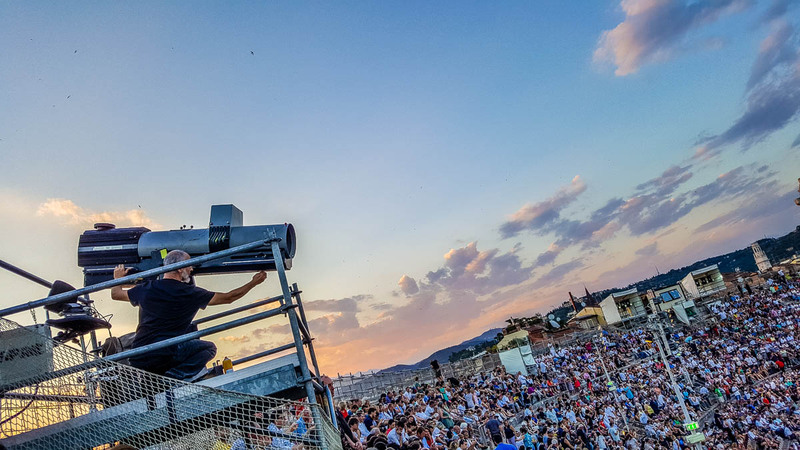 Soon, the lighting technicians took their places and started checking the settings of the large spotlights set up around the top edge of Arena di Verona. The sky slowly grew pink. On the other side of the stone amphitheatre, we could glimpse the city’s rooftops and the top portion of the Torre dei Lamberti – Verona’s tallest tower. Suddenly, the gentle flicker of candlelight slowly spread through the many rows with people. One hundred years ago when the arena was not electrified, candles were used to illuminate the first editions of the Verona Opera Festival. In homage to the historical beginnings of the festival, we had been given small candles upon entering the arena. Now, people were lighting them and then sharing the flame of their candle with the person sitting next to them. We lit up our small white candles too and held them for a few minutes admiring the effect of thousands of little lights dancing down the cascading rows of seats. In the meantime, the orchestra musicians had taken their seats and soon the sweet music of Puccini soared in the air. Hundreds of choir artists and dancers filled up the stage creating in mere seconds the illusion that we were at a traditional market square in China some hundreds of years ago. It was all so splendid, so well thought-out and so effortless. Nothing was left to chance yet it all looked so natural and unrehearsed like it was happening there and then for the very first time. The large screens showing the lyrics in both Italian and English certainly helped a lot to follow the action. Soon, I could feel the pain of the ice-cold princess Turandot struggling to find her place in a male-dominated world by refusing to be treated as a marriage commodity thus imposing impossible to solve riddles to any potential suitor. Unrequited love, gender power battles, beheadings, emotions running high, dramatic singing, lavish costumes, splendid decors – the stage kept my full attention for hours on end. Ping, Pang, and Pong – Turandot’s ministers – providing a welcome comedic relief among all the suffering and bloodthirsty threats. It was passionate, inspiring, tragic and soul-uplifting all at the same time. 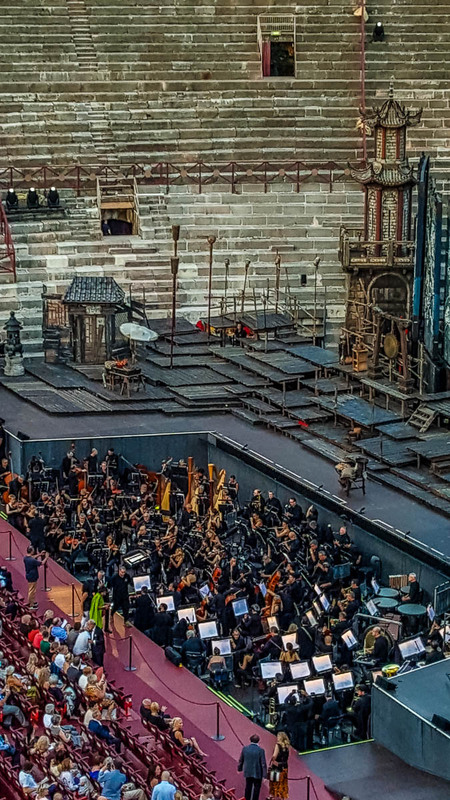 In the end, after the rapturous standing ovation, and with Arena di Verona gradually emptying after the emotionally charged performance, we slowly walked down to earth from our high in the sky stone step seats. It had been a beautiful experience. One to cherish for a lifetime. The Verona Opera Festival is one of the most prestigious opera events in the world. Each summer it attracts hundreds of thousands of people. The festival is traditionally held in the almost 2000 years old Roman amphitheatre known as Arena di Verona which is located in the heart of this Northern Italian city. The festival started on 10th August 1913 with a performance of Aida in commemoration of the centenary of Giuseppe Verdi’s birth. 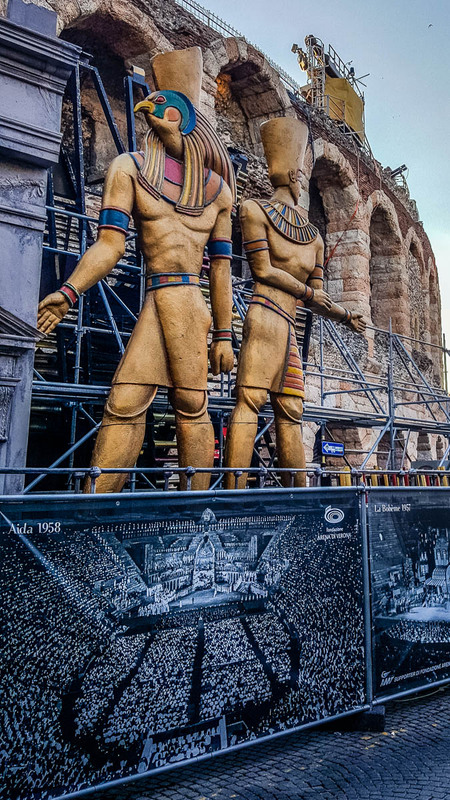 To this date, Aida is the most performed opera at the Verona Opera Festival. The very first festival performances immediately stood apart with their new scenographic style. Instead of using the typical for the era flat painted decors, three-dimensional stage sets were developed to really transport the spectator into the heart of the action. 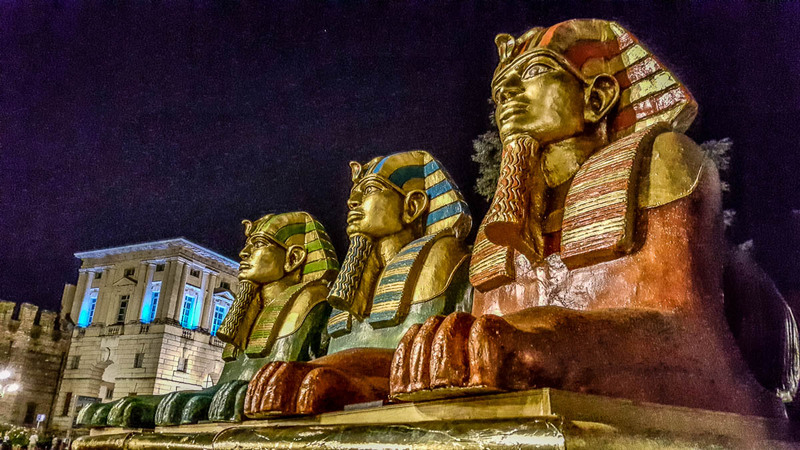 For some of the earliest performances live elephants and camels were brought on stage and once a small lake was created to conjure the water reflections of the river Nile in Aida. 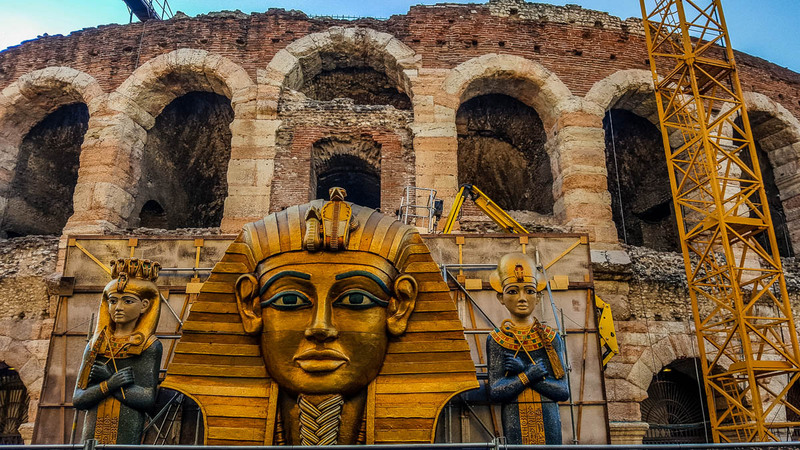 Some of the world’s most famous opera singers have graced the stage of the Verona Opera Festival. For example, Maria Callas was a regular between 1947 and 1954. This year marks the festival’s 96th edition as it was not held during the two World Wars. 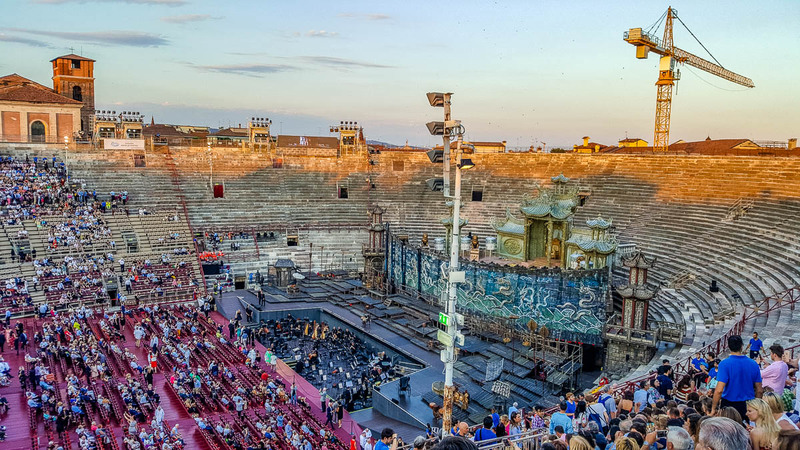 The Verona Opera Festival is held over (usually) 47 summer evenings starting from the last week of June to the last week of August. Around five operas are performed each season. There is also one or more lyrical evenings with special guests and, at times, an anniversary night dedicated to an illustrious opera singer. Over 1300 people are engaged in each performance. From dancers and choir singers to technicians and engineers (not to mention the lead performers), a lot of creative human power goes into making sure that you will be watching the most lavish and memorable opera performance in your lifetime. Tickets for the next edition of the Verona Opera Festival are released for sale during the festival’s current edition. For example, have a look at the official website for prices for summer 2019. To get your tickets at a special rate buy them before Christmas. After that, the ticket prices increase. Usually, you can find tickets for the different performances at a very short notice although bear in mind that the most popular operas may be sold out in advance. 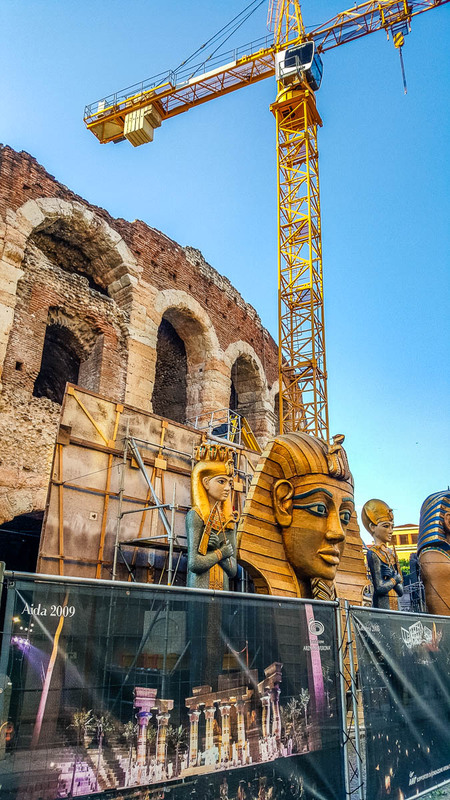 If you are a serious opera lover and plan to spend some time in Verona, you can invest in a season ticket giving you the chance to see all the performances at a discounted price. Click here for more details. School and University students, people with disabilities, people under 30 or over 65 years of age, and members of several associations and trade unions can purchase a ticket at a reduced rate at any time through the year. Check this page for detailed information how to do it. You can also buy a ticket for the special price of 10 euros if you commit to tweeting photos and your personal impressions during the performance. This type of ticket though has a very limited availability and sells out incredibly quickly. It is only offered to people under 35 years of age with a large social media following. You can find full details (in Italian) by clicking here. There is a wide range of price points for the Verona Opera Festival. You can pay less than 20 euros or in the hundreds depending on your choice of performance as well as how comfortably you want to sit and how close you want to be to the stage. The cheapest tickets are for the iconic stone steps. They don’t have assigned seats meaning that you need to arrive very early in order to bag one on the lower levels and sit facing the stage. Another thing that the stone steps don’t have is a backrest. Unless you choose to go to the very top tier and sit there. No matter where you sit on the stone steps, you will have a nice (albeit in most cases lateral) view of the stage. 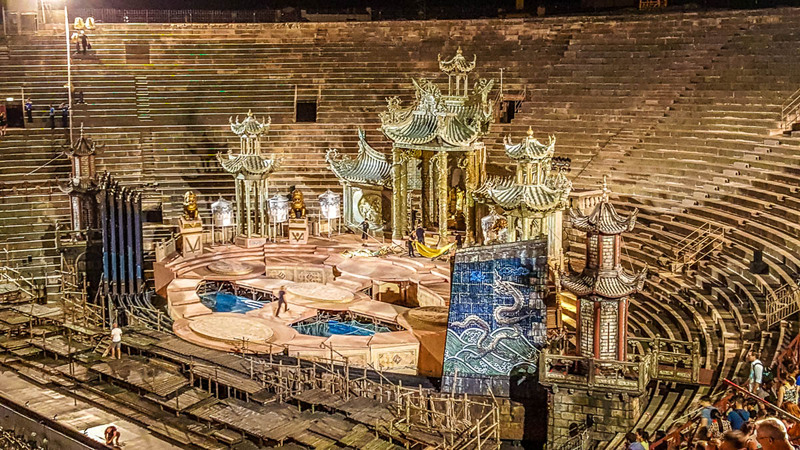 You may not be able to see the faces of the performers clearly, but you will be able to enjoy the full splendour of the stage set and have a wide angle point of view at the action on it. From personal experience, what I found very uncomfortable sitting on the stone steps was not the lack of backrest but the reduced legroom. If I stretched my legs I would have hit on the back the young German couple sitting in front of us, so I had to keep my feet tucked to one side which after a while got a bit uncomfortable for me. The best thing that happened was that the couple actually got up and left at the start of the second act. It made all the difference! All in all, though, the stone seats are a great option to see a world-class opera performance at a very reasonable price. If you want to really splurge then definitely look at the top end of the price list. The so-called GOLD seats offer you an upholstered backrest and a padded seat. Plus, you will be right in front of the stage. All this will set you back around 200 euros. In between, you will find several other price options offering extras like backrest and/or numbered padded seat. Before choosing your ticket, make sure that you consult the seating plan at this link. You can find a full description of the different types of seats here. And at this link, you will find detailed information about the arena’s many sectors and gates so that you know in advance which one to head to based on your ticket. Dress comfortably in loose breathable clothing. Chances are the day would have been very hot and sitting in the Arena waiting for the performance to start and for the sun to come down is no fun if you are overdressed and in tight clothes. I saw lots of ladies dressed in floaty summer dresses as well as lots of ladies dressed in light tops and trousers. So, it really depends on what you feel comfortable in. Of course, if you are in one of the GOLD seats or other more expensive seating areas, make sure that you pull out all the stops. It is your time to shine and people will be looking curiously at you so dress up. Plus, a formal dress code is required for these seats, although we saw plenty of people sitting there dressed much more relaxedly. Right before the start of the performance, the huge spotlights are shone on the people sitting on the stone steps. Apparently, each night a couple dressed especially nicely is plucked from there and moved to some of the best seats in the house. 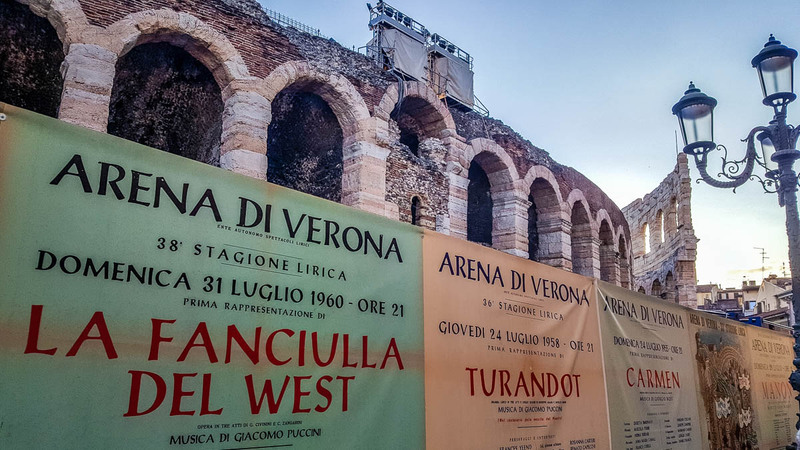 Arena di Verona is right in the heart of this Northern Italian city. You cannot miss it! Positioned at Piazza Bra (which is one of the largest squares in Italy), the Roman amphitheatre is impressive. 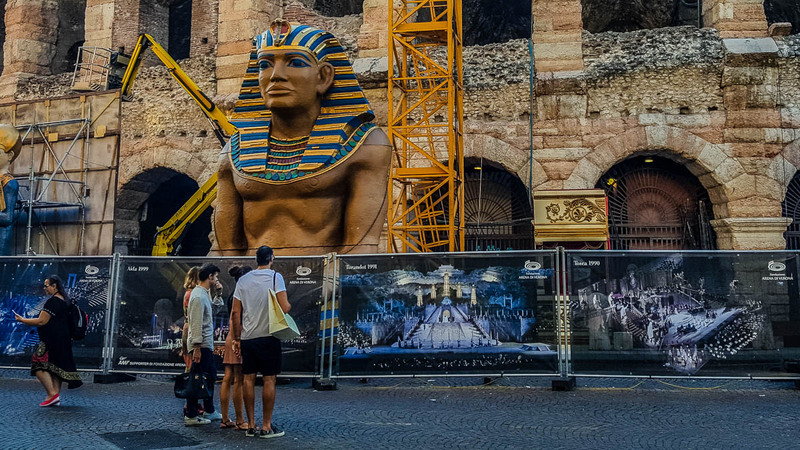 If you are staying in Verona’s historical centre, you should be able to walk easily and in a matter of minutes to Arena di Verona from anywhere in the old town. From the Verona Porta Nuova train station, you can walk the 1.5 km to Piazza Bra in just under 20 mins. Alternatively, you can take a bus. There are many bus lines which connect the train station with the square. Bear in mind that as the opera performance finishes around midnight public transport and trains may have stopped running for the night or may be running a reduced service so make alternative arrangements to get home. The nearest car parks to Arena di Verona are Cittadella and Arena. We have been using the Cittadella car park for years now every time we drive to the city of Romeo and Juliet. It is clean, modern, and very conveniently located a couple of minutes from the Roman amphitheatre. All in all, and considering car park prices in England, for example, it is not that expensive to use, especially as car traffic is subject to severe limitations in the historical centre of Verona and you cannot just drive in there. You can use the Cittadella car park’s official website for further information. Here is a link to the official website of the Arena car park for further information and prices, too. 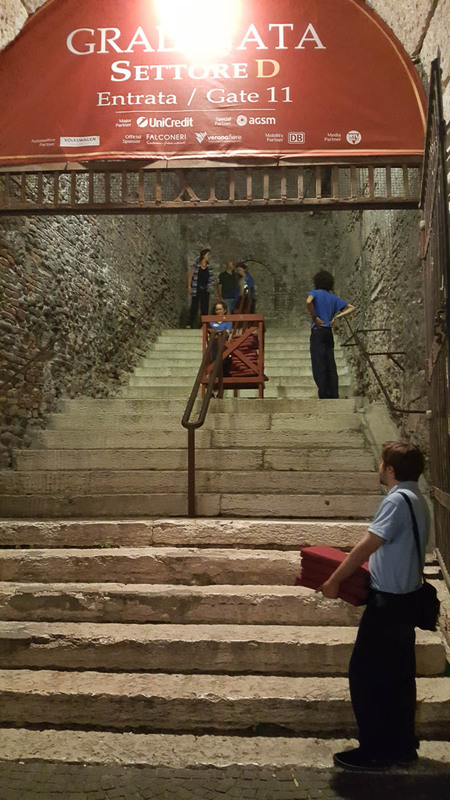 You will need to go through a security check before being allowed inside Arena di Verona. 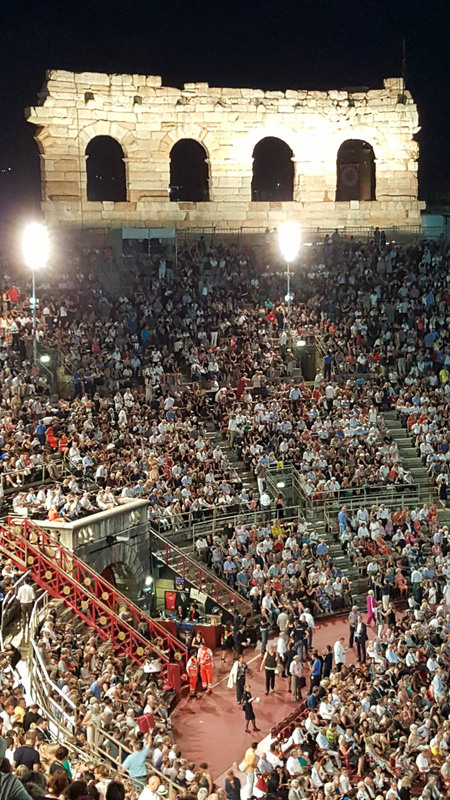 Thousands of people attend each performance so expect to have to wait for a little in one of the many queues which snake around the Roman amphitheatre. Find your entrance and join the queue. We found the system to be working very efficiently and even though our queue seemed intimidatingly large, it only took around ten minutes before it was our turn to go through the scanner and open our bags. The security personnel was very polite and spoke English. A number of Italian policemen were stationed around the arena, too. Be aware that bulky backpacks and bags are not allowed inside. The same applies to glass objects, bottles and sharp tools. You cannot take food and drink inside Arena di Verona. It had been very hot the day we saw Turandot and we left for Verona in a hurry so at the last minute I grabbed a large bottle of water with me as this was the only size water bottle I had at home. I was sipping from it in the queue and then the security guard asked me to leave it in the bin at the gate before I was allowed inside. Inside you can buy refreshments (soft drinks, beer, water and ice creams) from the vendors who move around the different seating areas. A fizzy drink is 4 euros. The performance with all its pomp and intervals lasts over three hours. So make sure that you have a good dinner before heading to the Verona Opera Festival. The area around the Arena is densely populated with eateries and restaurants to satisfy any budget. During the first editions of the Verona Opera Festival, Arena di Verona was not electrified and candles were used to illuminate it. 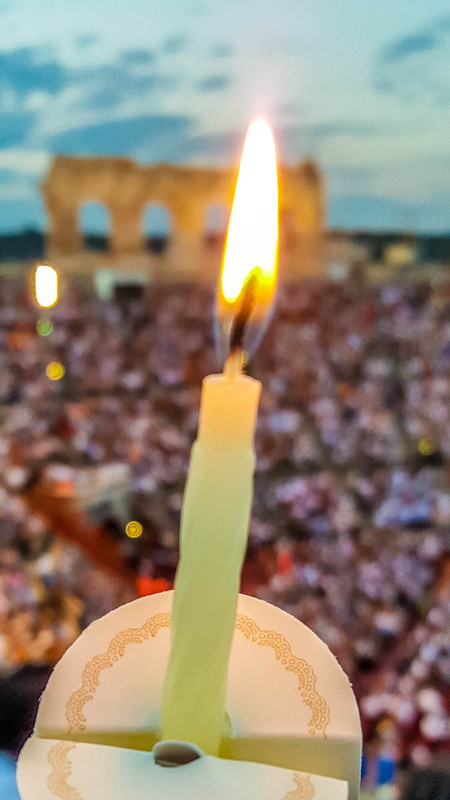 In homage of this historical fact, small white candles are handed to the spectators as they file into the Roman amphitheatre. Each candle comes with a small paper sleeve so that when you light it you don’t have to hold it with your bare hands and the wax doesn’t drip on you. Right before the start of the performance people start lighting up their candles passing the flame to the person next to them to light their candle, too. Seeing the Arena lit up by the hundreds and thousands of candles in the dusk is a sight to behold. You can hold your candle for as long as you want. Most people extinguished them after about 15 mins. If you are sitting on the stone steps or have a numbered place without a provided padded seat, make sure that you either bring a cushion with you or buy/rent one at the venue. For purely research seasons I tried sitting directly on the stone steps to see how it felt. I am not a fussy person but I could hardly last half an act without a cushion. The stone steps are quite hard and soon you start feeling it quite sharply. I was glad we had brought with us the softest decorative cushions we have at home. Alternatively, you can either buy a cushion before entering the arena or rent one inside. 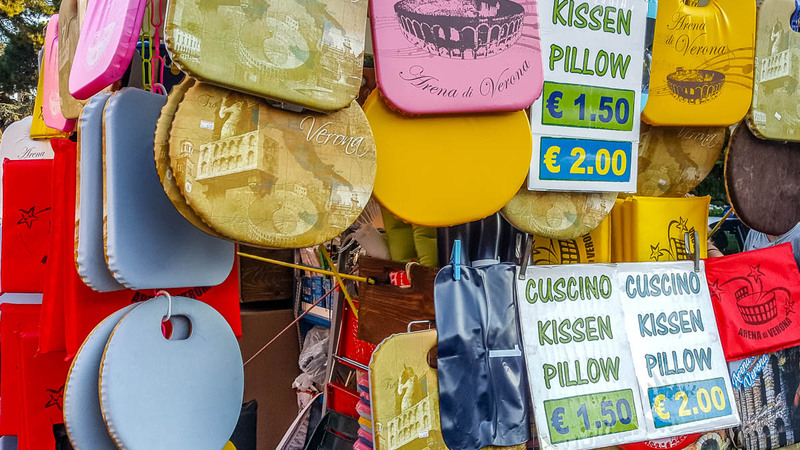 There was a special stall by the queuing area outside offering souvenir cushions for as little as 1.50 euros a piece. To rent a cushion inside cost, I think, about 5 euros. The people in the French group sitting behind us were particularly inventive and had brought with them swim rings which they inflated before the performance in order to sit comfortably throughout it. Taking photos, videos, and audio recordings during the performances at the Verona Opera Festival is strictly forbidden. Yet, there were people whipping their mobiles around us and taking a sneaky picture every now and then. I must say that one particular girl was especially irritating as she held her automatic camera out for the whole duration of the first two acts and was constantly trying to get a good picture. Unfortunately, she was right in my line of vision, so having a bright rectangle of light to bypass when I was trying to focus on what was happening on the stage was very unpleasant. Thankfully, the girl didn’t return for the third act. Please, don’t be this person. Enjoy the performance, no-one needs to see dozens of blurred photos of an opera stage, be it the most famous opera stage in the world. Here, I hasten to add that all the photos you see here were taken by me before and after the performance and during the intervals. I will be honest here and say that for a split second we considered taking our small child with us. I mean, we have taken her to some amazing places since moving to Italy so why not add an opera performance to the list. I will also honestly say that I am so glad that common sense prevailed and we decided not to do it. First, children under four are not allowed to attend the performances. In any case, having your child over the age of four with you there could be quite the taxing experience both for them as a child and you as a parent. First, it is hot. Very hot! We saw the first aid crew attending to two cases of people feeling unwell in the crowd. This was even before the performance had started. Obviously, I wouldn’t want to speculate as to what happened to the affected people, if it were the heat that overwhelmed them or if they had a previous health condition, but a crew of up to ten first-aiders surrounded them discreetly and helped them outside in a very quick and efficient manner. Second, trying to keep the attention of your child on the performance may be a bit of a challenge especially if they don’t have any previous experience with opera. I would gladly take my child to the Verona Opera Festival when she is slightly older. I would say 12 or 13 years of age but it would depend on many different factors. On this particular occasion, I was glad we had organised overnight childcare with a lovely childminder in Vicenza and my child had a very relaxed and happy evening instead of trying to work out why Turandot really had it in for her suitors. 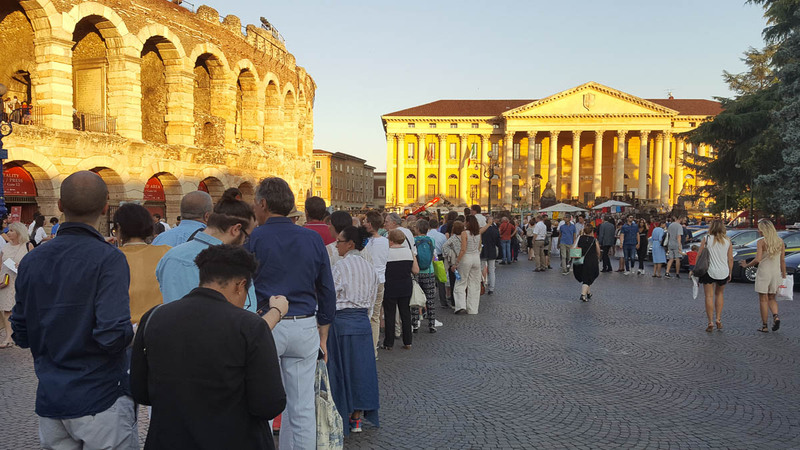 If you really need to go potty during a performance at the Verona Opera Festival, then choose your tickets carefully in advance. The toilets are in the immediate proximity of sector F (at least this was the case this summer). Which means that if you are sitting in any of the other sectors you need to walk outside of Arena di Verona, follow its elliptical outline to the entrance of sector F, do your business there and then return to your seat. In order to be re-admitted into the arena, you need to show your ticket again. So, don’t forget to take it with you, no matter how desperate you must be. If you are sitting on the unnumbered stone seats, it can be incredibly difficult to get up and walk down to the exit in the middle of the act. If possible, don’t do it as you will be inconveniencing a lot of people on your way down. It’s best to wait for the interval. There is a generously timed interval of 20 mins after each act. If you are efficient, it’s enough to reach the toilets. You can also use the intervals to get another drink/ice-cream or to indulge in some people watching. 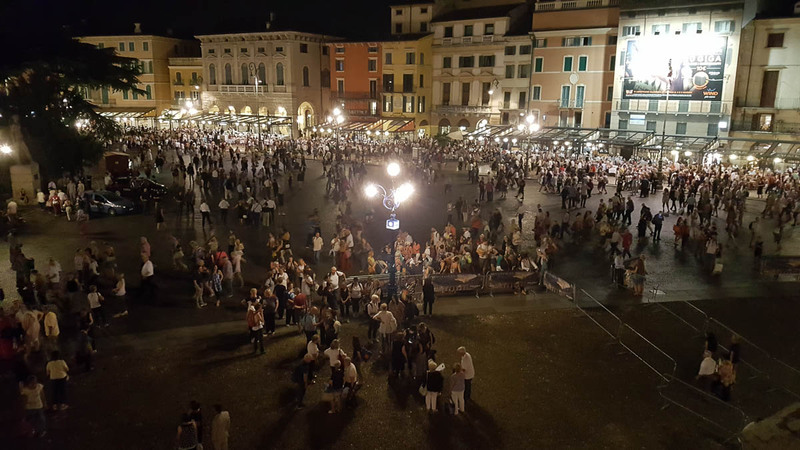 After the performance, we walked outside Arena di Verona and found Piazza Bra full of people having drinks and fun in the hot summer night. I was on such a high that I wanted to make the moment last as long as possible. If you don’t have anywhere urgent to be, consider joining the crowds and wind down for a bit. Verona is electric at night and it feels so good being among people after a great opera performance. Thankfully, I didn’t have to find out first hand what happens at the Verona Opera Festival if it rains. Usually, summers in Verona are quite sunny and dry. In case of a sudden downpour, please, refer to the terms and conditions of the festival organisers at this link. 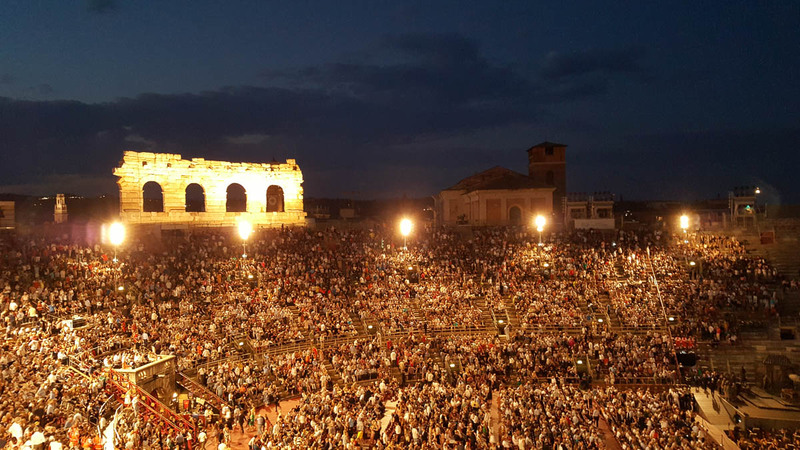 Be aware that no microphones or any such modern sound technology is used during the Verona Opera Festival. This is a direct nod to the historical origins of the festival when mikes had not been invented yet. So, don’t expect blasting levels of singing and music. The lead singers and the choir do their utmost best to fill in the arena with their powerful voices. Plus, the acoustics is outstanding. Yet, consider the sheer enormity of the place and you will understand why at times you will almost have to hold your breath in order to hear everything that is going on. It is quite wonderful, really, considering that there are thousands of people in the audience. Collectively, there is such silence and such concentration on the performance on stage, that you almost feel like you are taking part in a ritual. A ritual where music reigns supreme. 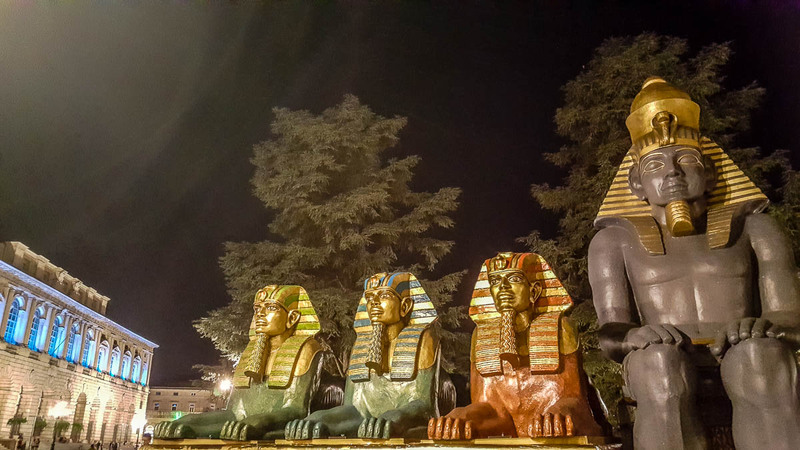 If you happen to be in Verona before the start or after the end of the Verona Opera Festival, make sure that you visit AMO Arena Museo Opera in order to learn more about the operatic art and see artefacts from the festival’s long history. For a full immersion, consider staying at Hotel Accademia in Verona. 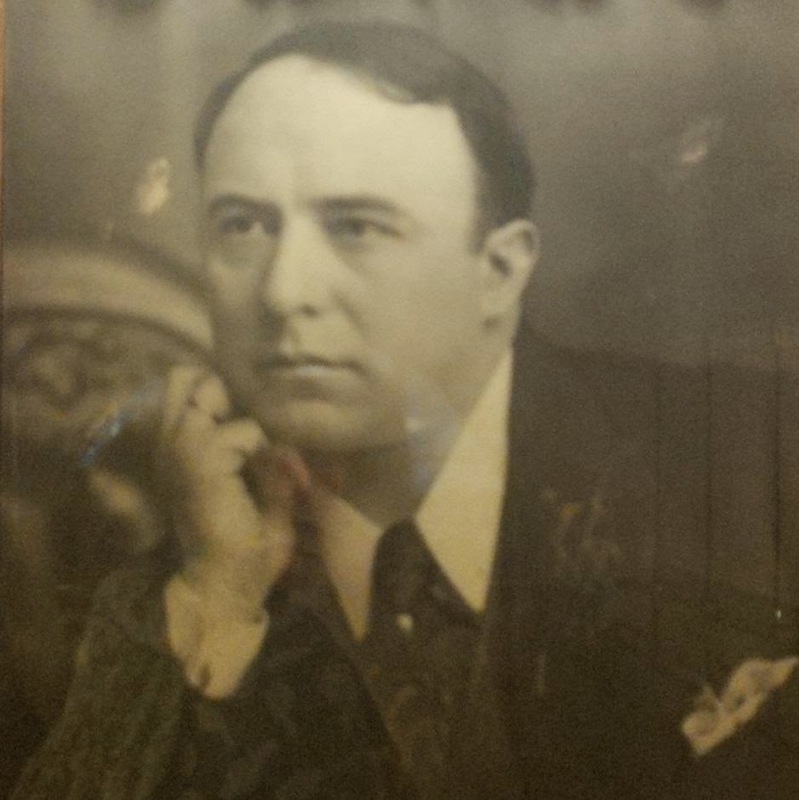 Giovanni Zenatello, a renowned opera singer and founder of the Verona Opera Festival, lived in Hotel Accademia, then bought it and the property is still owned by his family to this day. 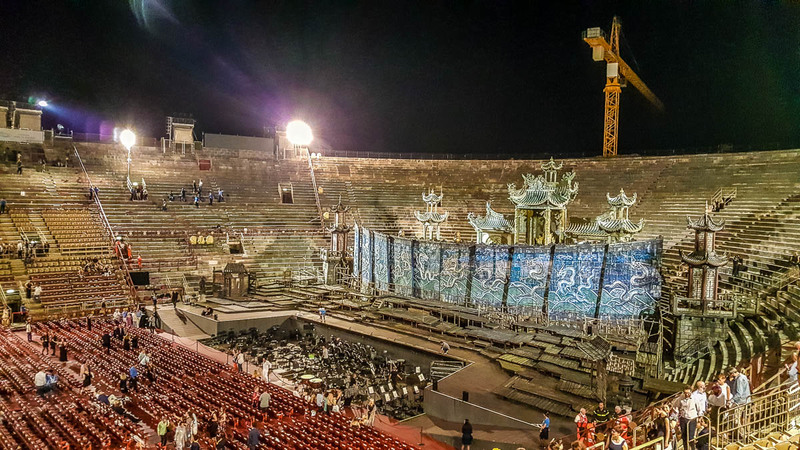 This is my detailed guide to the Verona Opera Festival including both a first-hand account and lots of practical tried and tested information. 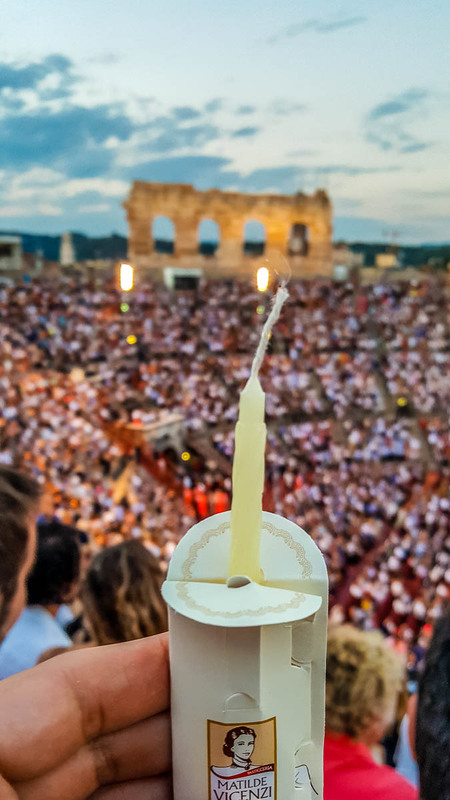 From when to buy tickets at the cheapest prices to where to sit, from what to wear to what to do with the candle you will be given upon entering Arena di Verona, everything is covered. 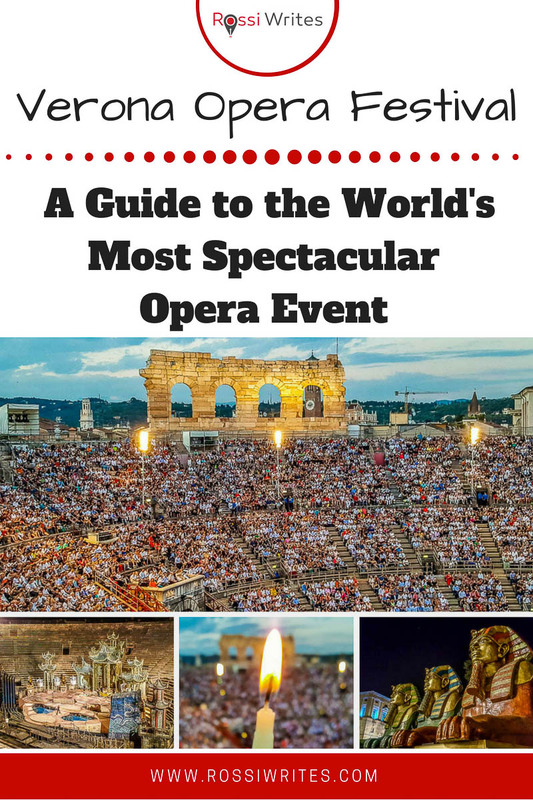 I hope you found my guide to the Verona Opera Festival useful! If you have ever wondered if you should make an effort and see an opera at the festival, don’t delay it. Grab your ticket, book your accommodation and start counting the days. Then let me know all about your experience. 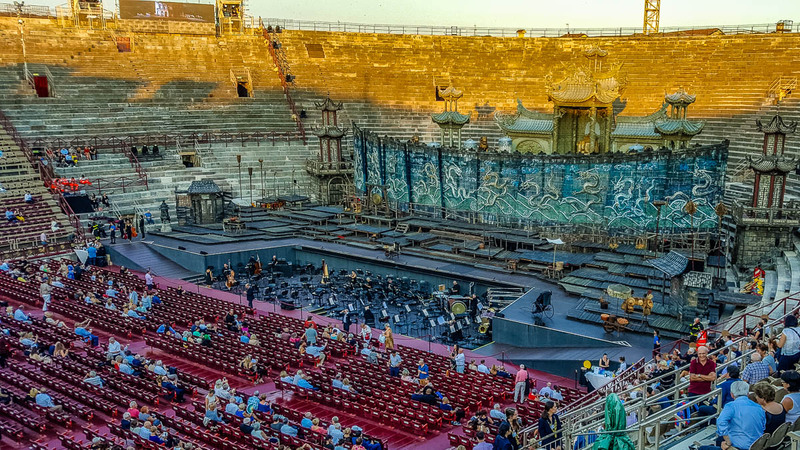 Have you already attended a performance at the Verona Opera Festival? Please, let me know what you would add to my guide above as well as what was your personal experience at the festival. 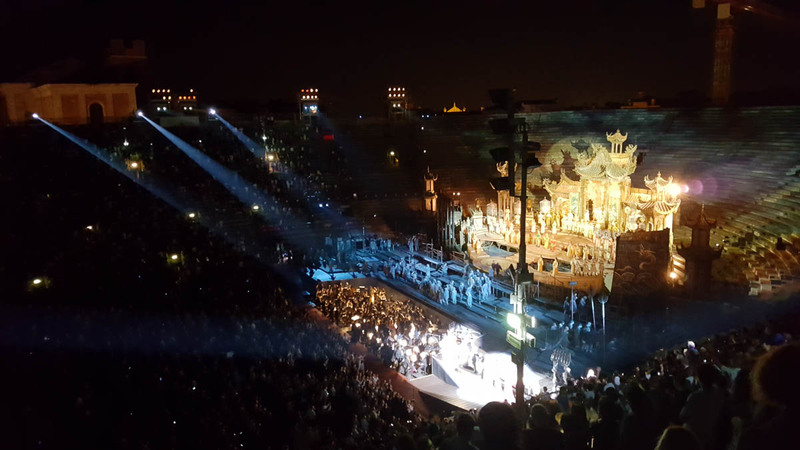 After the performance – Aida’s stage set, Arena di Verona and happy crowds.